It's sleek, it's styling and it's the right size. 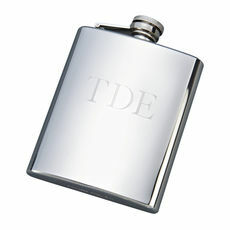 Our 8 oz Grey leatherette wrapped Stainless Steel flask. 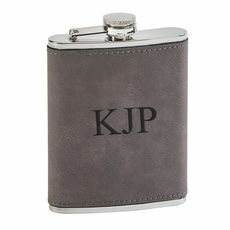 Flask cover is hinged so you will never lose it and the flask comes with its own..
Impress your friends with this personalized grey colored flask set. 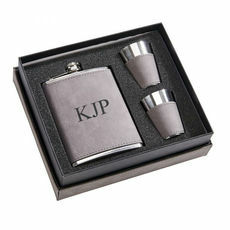 The set includes a stainless steel, 8 oz flask wrapped in grey leatherette, 2 stainless steel shot glasses in a matching grey.. It's sleek, it's styling and it's the right size. 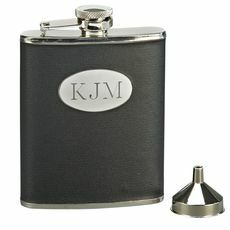 Our 6 oz Black leatherette wrapped Stainless Steel flask. Flask cover is hinged so you will never lose it and the flask comes with its own funnel for.. It's sleek, it's styling and it's the right size. 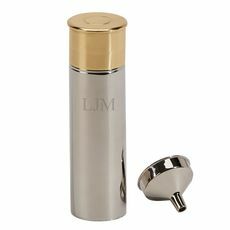 Our 6 oz Brown leatherette wrapped Stainless Steel flask. Flask cover is hinged so you will never lose it and the flask comes with its own..
Here’s a great gift for the outdoors person in your life. This unique stainless steel flask resembles a 5” tall larger-than-life shotgun shell. 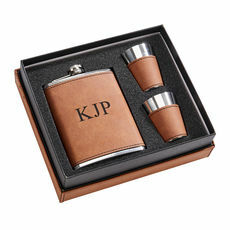 But open the gold-toned top and find the..
Impress your friends with this personalized caramel colored flask set. 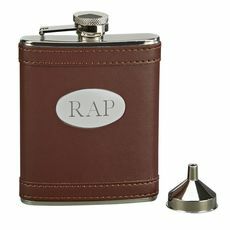 The set includes a stainless steel, 8 oz flask wrapped in caramel leatherette, 2 stainless steel shot glasses in a matching..
Our personalized flasks are just the right size to fit in a pocket or purse and are made of traditional stainless steel. 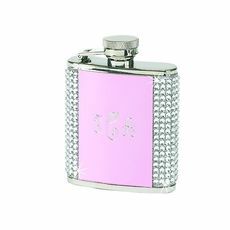 Feel confident when you fill the flask with your beverage of choice. They will not absorb any of the smells or colors of your beverages, creating a refreshing experience each time the flask is used. After choosing the color and design you prefer for you or your gift recipient, you will select the personalized desired. 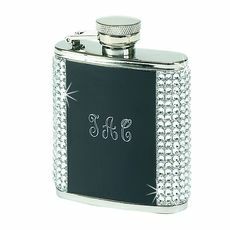 These flasks make a perfect gift idea for many occasions including birthdays, wedding bridesmaid or groomsman gifts, graduation presents and more.